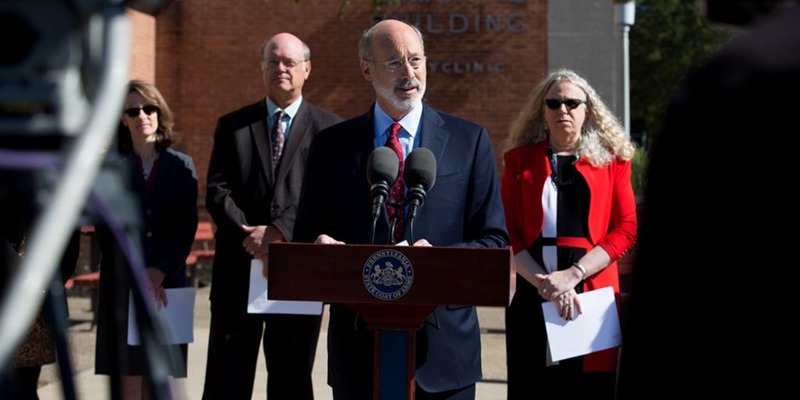 Harrisburg, PA – The Wolf Administration today awarded $1 million grants to four organizations to build medication-assisted treatment programs for Pennsylvanians suffering from the disease of addiction. The announcement was made at Pennsylvania Psychiatric Institute, a collaboration between Penn State Health and UPMC Pinnacle. Grants also were awarded to the Allegheny Health Network, Geisinger Clinic, and Wellspan Health. Pennsylvania’s hub-and-spoke model has an addiction specialist physician at the center as the hub, providing expert guidance and support to primary care physicians in rural and underserved areas of the state who serve as the spokes. The primary care physicians will provide the direct-patient care, including the medication-assisted treatment prescription. Patients also will be connected to drug and alcohol counseling in their communities. The grants are funded through the 21st Century Cures grant, a $26.5 million federal grant received by the Wolf Administration to combat the heroin and opioid epidemic by increasing access to treatment, reducing unmet treatment need, and reducing opioid overdose-related deaths through the provision of prevention, treatment and recovery activities for opioid use disorder. Twenty-three organizations applied.